The ground is being prepared for the new Lossiemouth High School. 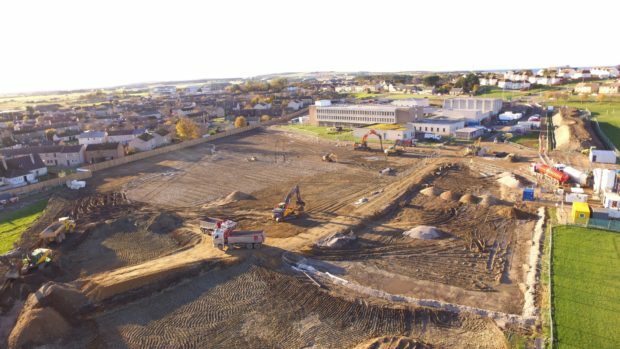 Aerial photographs have revealed the scale of the project to create a new £42million secondary school in Moray. Preparation works are now under way for the replacement for Lossiemouth High School. Contractors were on the site yesterday working to clear ground next to the existing buildings to make way for the new classrooms – ahead of the construction beginning next month. Fences have lined the site for several months as final approvals were given in order for the work, which will include injecting cement into the ground, to begin. Despite the later than expected start, the project remains on target to open in summer 2020 with facilities including community centre, library, swimming pool and artificial sports pitch. Heldon and Laich councillor James Allan said: “People have been getting anxious. The longer nothing has happened the more they have worried there are more delays. Sandy ground conditions have pushed the price tag of the new school up from an initial £31million to £42million, nearly £16million of which will be supplied by Moray Council while the remainder will be supplied by the Scottish Government’s Scottish Futures Trust. Changes to the design were continuing to be made in March when the local authority granted final approval for the 800-capacity campus. Sonya Warren, chairwoman of the council’s children and young people’s committee, added: “It’s very exciting to see it all underway now. Hopefully having seen all the benefits at the new Elgin High School will make people look forward to it all the more.